Tools like Facebook, Twitter, Yelp and Flickr have taught people the power of sharing more widely and have begun to alter attitudes about privacy. Today, you live more transparently and share more information than you ever would have been able (or willing) to in the past. Opinions, experiences, likes and dislikes that we used to share verbally to a handful of trusted friends and family today are captured, indexed and aggregated for all to see. The places you visit, the jobs you have held, the people you know, the food you eat, the teams you cheer, the hobbies you enjoy and the entertainment you love have become data points in a great pool of public information, permitting new ways to connect, commune, play, work, discover, complain, praise, influence and learn. Too often, people think of social media only as the immediate and ephemeral information Twitter or Facebook presents in their news feeds. These real-time social feeds demand attention and can be at once enjoyable, distracting and annoying, but there is another way to think of social media, and that is as a persistent data layer. Social networks do not simply share your data in the moment but retain it so that tools and applications (and marketers) can later access, recall, combine, process and convert that data into useful information. 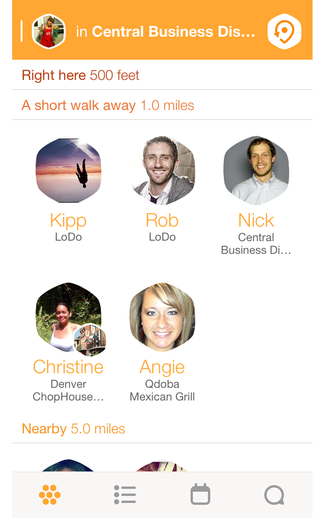 alerts you to nearby friends. Here is an example of how the social data layer works: No one wants to be informed of every place that every friend visits, but when you are deciding where to eat, you may find it valuable to know where your friends are dining at the moment or which restaurants they frequent most often. What is noisy data in your news feed can be transformed into useful, relevant information when aggregated and presented at just the right time and right situation. Facebook’s vision for the future is that you will check into a beach and discover that your parents visited that same spot two decades earlier—and look, they posted a picture! The social data layer can take something that seems meaningless at one time (old family photos) and make it available at another when that information will be pertinent and valuable (your parents sharing the same moment you are, separated by decades). It is one thing for social data to inform and influence your purchase decisions, but increasingly social is furnishing new ways to procure goods and services. The next wave of change is not just peer-to-peer (P2P) information but P2P commerce. A new collaborative economy is growing with a shift away from traditional ownership and toward “peering,” offering new methods of sharing or renting goods and services that permit consumers to gain economic power, increase income, and save money. Why purchase an expensive item when you can more economically rent or borrow it, instead? Why let the things you own sit unused when they can easily be converted into cash flow? Why drive anywhere with empty seats in your car when someone nearby is willing to pay you for a lift near your destination? Why rent a car overnight when you really only need it for an hour? Why spend your time doing chores you do not enjoy when you can easily find and pay someone to do those tasks? And now that you have more free time, why not offer your own talents and skills to neighbors willing to pay for what you have to offer? Thanks to new technologies and new consumer attitudes, there today are different answers to these questions than in the past. This is the collaborative economy—new methods for people to collectively consume resources for mutual economic benefit. We can illustrate the difference between the traditional ownership economy and the sharing economy by examining the old, new and newer way of procuring an automobile. We are all well acquainted with the old way in the automotive business. One party (and its supply chain partners) manufactures, transports, inventories and sells the cars, while consumers buy, maintain, insure and own them. The problem with this business model is that it is wasteful and expensive. The average car owner in the United States, Canada and Western Europe uses his or her car just 8% of the time, which means that an expensive and depreciating household asset goes underutilized the vast majority of time. Buying, financing, maintaining and insuring cars devours a substantial portion of people’s income—transportation is the second highest category of household expenditure, according to the US Bureau of Labor Statistics. Automobile ownership also ties up large portions of our available assets; Pew Research Center found that equity in motor vehicles is the third largest non-retirement category of net worth for households worth $499,000 or less. In addition, the old ownership model in the auto business is also hard on the environment, as enormous amounts of energy go into producing, distributing and disposing of cars that mostly sit idle. The old way will not die, at least not quickly. Just as ecommerce has not replaced physical malls, neither will the traditional auto dealership disappear as the sharing economy grows. Of course, while malls still exist, many struggle to survive and stay relevant, and their trials are hardly over; analysts estimate that one in seven malls will fail in the next decade as retail continues to transition online. Auto dealerships will face the same squeeze. The soft economy has meant difficult times for auto dealerships in recent years—over 4,500 disappeared (almost 20% of the industry) between 2005 and 2012—and consumers’ changing social consumption habits spell more trouble for the future. Zipcar represents the new way of conducting business. In this business model, Zipcar owns, maintains and distributes vehicles over a wide geographic area, and consumers rent only the car they need when they need it. Cars are utilized a greater percentage of the time, so waste is lessened and the impact on the environment is reduced. At the same time, Zipcar customers increase their liquidity and decrease expenses. I can use my household as a perfect example. When we sold our car and embraced a car-free lifestyle, my wife and I expected we would need to rent a Zipcar on at least a weekly basis; instead, we found we need one less than once every month or two. This experience is not unusual; research has found that consumers who carshare have 27% fewer vehicle miles traveled and make fewer trips. Of course, Zipcar is not available in every neighborhood, nor is it feasible for Zipcar to scale into every suburban or rural nook and cranny. If Zipcar spreads itself too wide and thin, it may have automobile assets that do not get appropriately utilized. This is why a newer form of sharing economy model shows promise. There is an even newer way of transacting business—a more peer-to-peer way—as represented by companies like RelayRides, Getaround, Hubber and JustShareIt. Unlike Zipcar, RelayRides does not own and maintain vehicles; it merely connects people who own cars with those who need transportation and wish to rent cars. In this “newer” P2P commerce method, renters enjoy the same benefits as they would with Zipcar—access to nearby cars for short periods at a modest cost. This much is the same as the “new” form of social business, but this “newer” form also offers benefits to car owners. Automobile owners no longer need to let their expensive asset sit unused in the driveway but can, with little effort, increase the use of that asset and enhance their income. According to RelayRides, the average car owner renting his or her vehicle is making $250 a month using the RelayRides platform. Some make less and others make more; one recent Yahoo article profiled a woman who has made $12,000 since 2012 renting out her Prius on RelayRides. While Zipcar would lose money if a car it owned were only rented for $100 in a month, the same is not true for RelayRides' car owners; for them, that $100 is a terrific benefit that increases income and puts an otherwise underused asset to work. This is why the newer P2P business model can scale in ways Zipcar cannot. Zipcar needs to place cars in limited areas with sufficient population density, while RelayRide owners are happy to rent their car a day or two a month to people in their less-populated rural or suburban neighborhood. While the "new" way--a company owning and renting out cars--does not easily scale today, the future may be quite different as self-driving cars and carsharing converge to offer a "newer new" way. Ten or 15 years from now, services like Zipcar will not need to spread cars every few blocks in order to place them within walking distance of customers; instead, the car you want will arrive wherever you are and whenever you need it, delivering itself to your front door--the transportation you need on demand. Want a private drive? Of course! 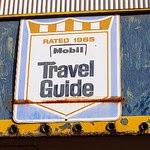 Want to split trip costs but make an extra stop? The service is aware of someone nearby who needs a lift to a destination close to yours. Care to pick up a friend? The service can access your friend list and alert him or her that you are on the way. Late to your dinner reservation? No worries, the restaurant has been automatically informed of your delay and new ETA. Technology, transportation, peering behaviors and the social data layer will combine to offer services that were previously (and are presently) impossible. Today, it is estimated that each shared car under the "new" approach takes between nine and thirteen cars off the road. The "newer new" way will have an even greater impact, taking more cars off the road and bringing the advantages of carsharing to much wider areas. The benefits to consumers and the environment will be substantial, but the difficulties faced by the auto industry will only mount in the next decade or two. Much like the the rail business of the early 20th Century (that did not adjust for trucks, cars, planes and highways) or the retail business of the last decade (that struggled to adjust to online commerce), the collaborative economy will leave the car industry a much, much different business. And the auto industry is not alone. 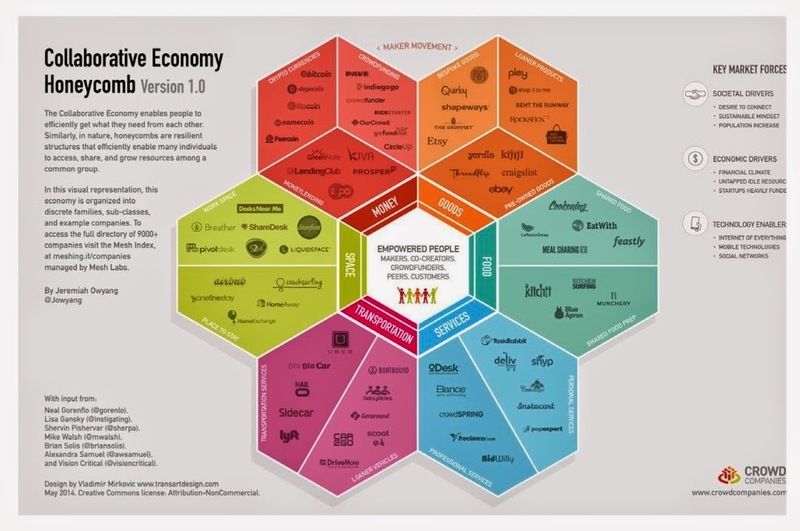 How Will the Collaborative Economy Change Your Business? Each of these could further develop into their own "newer new" business model. Might a hotel chain, that today owns one property in a city with 300 identical rooms tomorrow offer 300 different rooms scattered across dozens of small locations, matching you to exactly the room you would most prefer? (You love shaker style furniture, a shower, a large desk, a small bed, healthy snacks and tea service downtown while your traveling peer prefers retro 50s decor with a tub, no TV, a king-sized bed, junk food and a coffee percolator uptown? No problem--everyone gets exactly what they want!) Might your money account automatically loan cash to trusted friends and collect interest without bothering you for approval, since your financial institution knows whom you trust and acts to maximize your return? Might drones deliver your hot and delicious meal at the moment you arrive home from work, created by a famed chef a continent away who beamed his creation to a culinary 3D printer near you? Comparing the old, new, newer and future ways of commerce not only illustrates how the sharing economy works, it also demonstrates the changes that are coming to business. Just as the adoption of the Internet brought about a significant wave of disintermediation and reintermediation (with Amazon replacing Borders, Apple iTunes replacing Tower Records and Netflix replacing Blockbuster), the sharing economy will bring another such wave. Companies that offer the new products and services in the ways that consumers desire can acquire and retain customers, while the companies that fail to satisfy new consumer demand risk losing customers. There is no corner of the economy that e-business has not meaningfully affected, and now the burgeoning sharing economy is bringing still more change to the business environment. In future blog posts, we will explore the collaborative or sharing economy in more detail and study how traditional firms can explore, adjust and flourish in this new, emerging economy. There's been a bunch of attention given to the topic of Facebook and trust as of late. Some folks got worked up when it was revealed that Facebook would leverage users' browsing history and app data to better target ads. Then there was the infamous study that demonstrated your news feed was not really personalized to you but could be manipulated as Facebook sees fit. What I find ironic is that people will vent a great deal at Facebook while doing little to protect their own privacy. Whether they are ignoring Facebook settings that can better secure their information, approving unnecessary and untrustworthy apps or even giving up personal information without thinking, consumers are generally their own worst enemy. I thought I would share a few suggestions that you might consider if you are concerned about the collection and use of your personal information and surfing habits. You probably think that you have been careful and only given permission to access your Facebook data to familiar and trusted applications. You are probably wrong, and it only takes a couple minutes to find out. While some express concern about what Facebook may do with their personal data, it is shocking how many people will simply open up their data stream--including their posts, likes, locations, political views, friendships and other data--to complete strangers. This can happen when you give permission to Facebook applications. While visiting Facebook in a browser, click the little down arrow in the upper right corner and select "Settings." In the left column, select "Apps." At the bottom of the "Apps You Use" section, click "Show All Apps." Each of the listed applications may be accessing and using your personal data. If you see apps you no longer use (or may not recognize), click the little "X" on the right and select "Remove" from the pop-up box. Everyone loves those online quizzes, don't they? (Well, I don't, but I'm a grumpy old man.) Who doesn't want to know what Tarot card they are, or animal, or Disney princess, or composer, or superhero, or constellation, or deadly sin, or dipping sauce, or punctuation mark... God, I really hate these dumb quizzes. If you simply must know what classic rock band you are, then here is a tip: Go incognito in Google Chrome. To do so, right click on the link to the quiz and select "Open link in incognito window." You can now complete the quiz without having your answers captured and used for ad (or spam) targeting. If you simply click the links to these quizzes, the sites can use third-party cookies to associate your answers with your identity or your surfing habits. Think of the kind of personal information these quizzes ask (and most people willingly give up without a second's thought). A question such as "What is your greatest concern?" or "Which question would you most like answered?" can reveal if you have money, health or your love life on your mind. You wouldn't tell your bank or a person on the street that you have concerns about your relationship with your spouse, your finances or your health, so why tell the complete stranger who created the quiz? Of course, the safest course of action is to forego those quizzes altogether. And remember, if you share your quiz results on Facebook, you are simply encouraging other people to disclose their personal information to whomever created the quiz. The Digital Advertising Alliance permits consumers to opt out of behavioral targeting. This tool allows you to see the participating companies that are customizing ads within your browser based on your surfing habits. You can select one or all of them (including Facebook) and choose to opt out. Doing so stores an opt out cookie in your browser, which means you have to repeat the process on every PC and browser you use. Keep in mind, if you opt out, advertisers cannot target ads that may suit your interests based on your online behaviors. It also means that some free sites and services that rely on advertising revenue may get less of it because of your actions. So, before you hack away at those behavioral ads, consider the ramifications. For more information or to opt out from this type of online advertising, visit AboutAds.info. 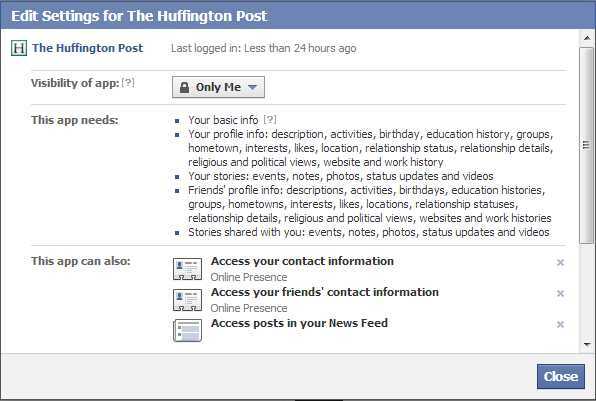 There are many more ways to protect your privacy when using Facebook or surfing the web, such as tightening your Facebook privacy settings, installing apps to prevent tracking requests in your browser, deleting browser cookies, using anonymous surfing VPN software, and removing your data from marketing databases such as Acxiom. Of course, if you simply keep giving up your personal data to Facebook applications and sharing your preferences, concerns and activities on quiz sites, no amount of privacy settings or special software will protect you. You are your own best first line of defense. For many years, I have been a big fan of Vienna Teng. Her latest remarkable release, AIMS, is a departure for Teng and takes a more digital direction. Included on the album is a haunting tune that, if you listen carefully, is about the sorts of tracking done by database companies such as Acxiom. Should we object to this tracking, or is it really what we want? Enjoy the tune and ponder the answer. Is It Time For a Mobile Mind Shift Or a Customer Mind Shift? I just finished the book "The Mobile Mind Shift" by several of my Forrester friends, Ted Schadler, Josh Bernoff and Julie Ask. (If you use that link, you can download the first two chapters for free!) It is a good and timely book about how brands must monitor consumers' changing mobile habits, identify "Mobile Moments," empower employees and transform business processes. This point is underscored by the new 2014 UPS Pulse of the Online Shopper study conducted by comScore. You may be surprised to learn that a whopping 61% of consumers still prefer a PC for researching products, and the next most common research channel, preferred by 13% of consumers, is physical stores. Only 1 in 5 consumers prefer smartphones or tablets for research at the current time. The preferences are no different for purchasing products--in fact, consumers are even more oriented to PCs and physical stores for purchase. Just one in nine people prefer to buy on tablets or smartphones. Of course, consumers will continue to shift to tablets and smartphones for research and shopping, but a substantial portion of your customer base will not be giving up their PCs any time soon. Even when consumers do shift research and shopping preferences to mobile, brands must be careful with their assumptions about what this means. For instance, the same study found that when shopping on mobile devices, more people prefer a retailer’s full website (41%) than mobile websites (34%) or mobile apps (25%). The mind shift your brand must make is not to be mobile but to be responsive to customers in every channel. [Tweet that] If your brand is shifting to mobile but ignoring users of PCs and those who prefer full websites, you are making a terrible mistake. Which of these data points is more vital to your brand? that consumer do not use many apps? As you adopt more mobile practices, be careful not to misread the data; for example, too many brands today are racing to launch their own apps. 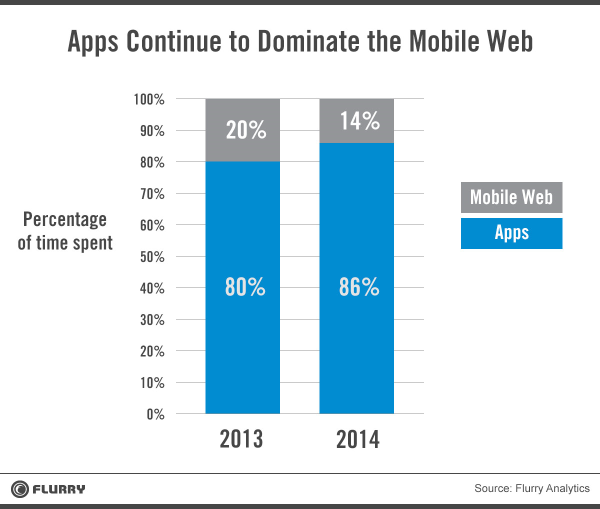 This seems reasonable based on the data that shows apps dominate the mobile web. That's an interesting data point, but here is a better one to help mobile planning at your organization: While Nielsen has documented a substantial 65% increase in time spent with mobile apps over the past two years, the number of apps consumer use has changed very little. 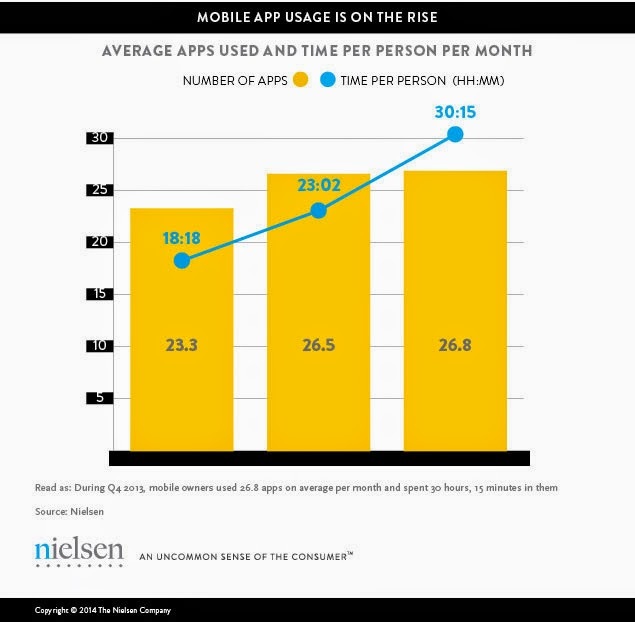 Nielsen reports that the average number of apps used per month grew from 23.2 to 26.8 in those same two years. In other words, consumers may be ever more addicted to their Facebook, Twitter, WhatsApp, Candy Crush and Instagram, but they are just not that interested in your app. Unless your customers have a compelling need to interact with your brand regularly while out and about (such as banking or paying with the Starbucks app), a mobile app may not be the best strategy. There is a pervasive attitude in business nowadays that companies are not adjusting quickly enough to the adoption of smartphones. I agree that is a risk, but I don't think that is the biggest risk companies face today. After all, companies scrambled 15 years ago to adopt to consumers' Web mind shift, but many did so in the most vapid of ways, launching static websites and banner ad campaigns rather than changing how they conducted business in a digital world. 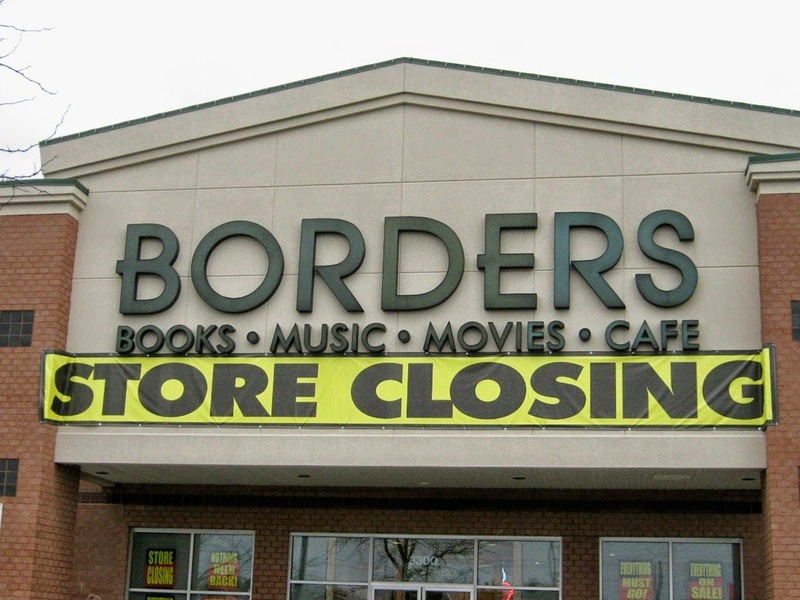 While Borders used the web to market its physical stores and books, Amazon made buying and downloading books easier--Borders made a web mind shift, but Amazon made a customer mind shift. If companies launch mobile mobile apps that merely cut and paste today's web functionality into an app, they should not be surprised when they fail. Sure, Sears can launch a mobile app so people can shop on their phone, but how many people are going to boot up a Sears app regularly? Compare that to Amazon's new Firefly feature on the Fire phone, which uses the phone's camera to identify products in the real world and instantaneously provide links to that product in the Amazon Marketplace. Retailers that simply offer traditional web shopping in an app are making a mobile mind shift, but that will do little to combat Amazon as it continues to lead the customer mind shift in retail. The mobile mind shift demands that brands use mobile technology, but a customer mind shift may suggest other ways to win the customer. For example, Sears has spent the past decade cutting in-store staff to a bare minimum (or below) to try to keep costs in line with shrinking margins in bricks-and-mortar retail. (Sears head count per store is now less than half the industry average.) But think about the brands that are succeeding in physical retail--Restoration Hardware, HomeGoods, Kate Spade and Lane Bryant lead the market in sales per square foot growth, and they didn't achieve that by offering a poor customer experience. A new mobile app may help physical retailers a bit, but it will take more than an iPhone and Android offering to stem Sear's bleeding. (Sears Holdings' market cap is down more than 80% in the last six years.) The only way for Sears to respond to a mobile mind shift of smartphones with showrooming apps is to provide a unique, differentiated, value-added experience in the physical space. Having the proper staff and offering digital in-store assistance is the way to keep people shopping and buying in the real world (where 94% of all retail still happens in the US! ), which means Sears' most pressing need is not to make a mobile mind shift but a customer mind shift! I am not arguing against the mobile mind shift, but hasn't the time come to stop worrying so much about channels and instead focus more on the customer? Tomorrow's customers will be more mobile, of course, but they will also be more social, more digital, more inclined to rent and share than to buy and own, more demanding that brands earn their trust and have higher expectations that brands will act proactively and in real-time to resolve problems. Go ahead and launch your mobile app, but if you are counting on that to keep your brand relevant, I respectfully submit you will be deeply disappointed.